Homemade ice cream topping makes for a real treat to give as a simple gift, or to enjoy on vanilla ice cream at home.Â It was fairly easy to make with the help of my new candy thermometer.Â The only modification I made was to add walnuts instead of pecans, and I toasted the walnuts before adding them to the sauce. 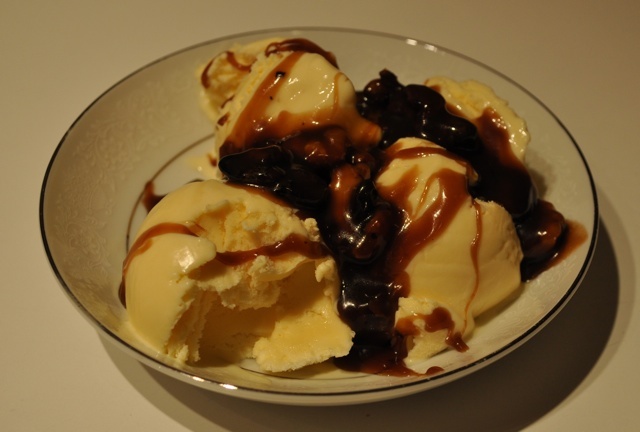 The recipe can be found at: http://www.relish.com/recipes/butterscotch-bourbon-sauce/ . Kellie, is this the one that Uncle Rene and Aunt Marie left in our fridge from our Christmas get together? We may have to crack it open and enjoy a sampling before they claim it.